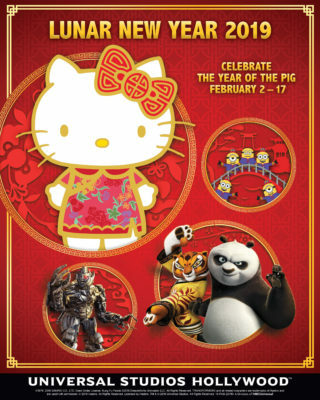 UNIVERSAL CITY–Universal Studios Hollywood ushers in the “Year of the Pig” as the movie-based theme park celebrates Lunar New Year with uniquely-themed programs featuring beloved global pop icon Hello Kitty, DreamWorks Theatre featuring “Kung Fu Panda” masters Po and Tigress and a Mandarin-speaking Transformer’s MEGATRON from February 2 to February 17. More information is available at www.UniversalStudiosHollywood.com. Mandarin-speaking guests can learn more about the Lunar New Year event at www.ush.cn.